Sometimes you just need some good Greek food: gyros, pastitsio, and spanakopita. Aldi sells a gyro kit in its freezer section that is pretty good. The store also offers an array of rotating Special Buy international foods ranging from Indian to Thai, and, at times, Greek. My family tried the Journey to Greece Flavors of the World Spanakopita, and the pastry pieces quickly disappeared from the plate. The pastries are kept frozen until ready to prepare. 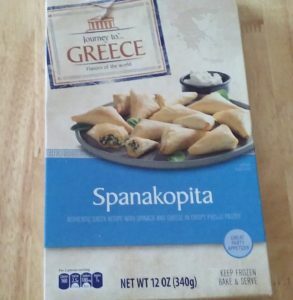 The box includes directions for baking the spanakopita for 18 to 20 minutes in a 400-degree oven, and it is specified that the pieces are not to be separated or broken apart prior to baking. The directions recommend letting the baked pastries stand for five minute before serving. They come out the oven hot! The pastries bake up crisp, flaky, and golden brown. The pastry flakes almost melt in your mouth, and the cheesy spinach filling is satisfying. This makes a good side dish for dinner or a nice lunch all on its own, maybe with a garden salad. It’s been a few years since I last attended a Greek festival, so I cannot speak to the Journey to Greece Flavors of the World Spanakopita’s authenticity. It does taste good, though. Recommended. Flavors of the World, Journey to Greece. Bookmark. The ingredients list also says vegetable fats and OILS. I believe this is the Palm Oil component. This is not spelled out on the ingredients list, quite misleading and people should be aware that this is an ingredient in this product, which is quite unnecessary. It is not a Greek ingredient is it. And these plantations are the cause of the loss of habitat of the orangutan populations in Borneo, and require the destruction of rain forest not only in Borneo but in many areas in Asia, where most of the palm oil is produced. I never buy anything that has palm oil in its ingredients. It is money making without consideration for the environment. There is no such thing as SUSTAINABLE PALM OIL PLANTATIONS. I will never buy this product again.